From a remarkable new Australian author comes THE ANCHORESS, a story set within the confines of a stone cell measuring seven paces by nine. Tiny in scope but universal in themes, it is a wonderful, wholly compelling fictional achievement. 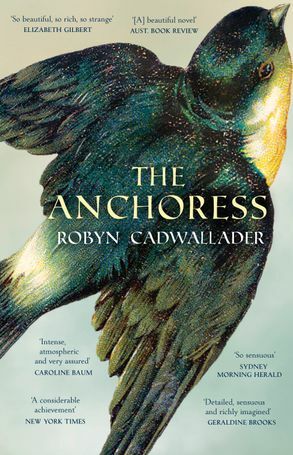 Telling an absorbing story of faith, desire, shame, fear and the very human need for connection and touch, THE ANCHORESS is both mesmerising and thrillingly unpredictable. Robyn Cadwallader has published numerous, prize-winning short stories and reviews, as well as a book of poetry and a non-fiction book based on her PhD thesis concerning attitudes to virginity and women in the Middle Ages. She lives among vineyards outside Canberra when not travelling to England for research, visiting ancient archaeological sites along the way.